Thermo Fisher offers personal protective equipment (PPE) and devices offer worker protections from chemical hazards as well as health hazards such as noise, vibration, heat or cold, dust and particulates, toxic gas and vapour, radiation and infectious diseases. We work closely with occupational hygienists and local professional associations to ensure employers’ health in workplaces and assist employers implement appropriate strategies for controlled environment. 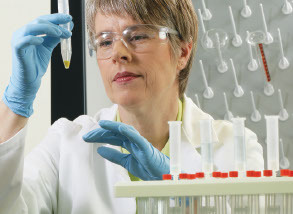 The most commonly used media for industrial hygiene sampling are sorbent tubes and filters. Thermo Fisher supplies collection media to measure the concentration of the particulates and bioaerosol, gas or vapors the employee was exposed to and subsequently provide data readings required in a written report. An extensive range of reliable precision-engineered particulate (dust) monitors and constant flow air sampling pumps for industrial hygiene, safety, environmental, occupational health, and indoor air quality applications. Where it is not possible to so remove the contaminant the employees shall be provided with suitable respiratory protective equipment in accordance with Section 6 of AS/NZS 1715. Thermo Fisher supplies full line of high quality respiratory protection from leading industry brands including full and half masks, disposable masks, dust masks. Furthermore, we also offer innovative and medical certified respirator delivering significant safety and compliance benefits over traditional masks. Industrial Hygiene Vibration Monitors – hand, arm, whole body and general vibration exposure monitoring, assesment and product compliance. Industry leading lone working Solutions. Wireless single or multiple gas detection integrated with most advanced safety monitoring platform providing two-way voice communication, text messaging, evacuation management and complete customization for every business. Complete range of “best in class” safety equipment from world leading suppliers including safety goggles and gloves, earplugs and earmuffs, coverall suits, disposable and cleanroom garments, welding curtains, screens and blankets, harnesses and lanyards.